Ocean Driven: The Chris Bertish Story is an inspiring surf documentary about self-belief, will power and the human spirit. Describing himself as a Waterman, Bertish has been instrumental in getting the film finished over the last 4 years, another achievement in itself, in addition to writing Stoked!, an inspiring story about courage, determination and the power of dreams. Chris Bertish is a South African big wave surfer, whose love for water sports was passed down to him and his brothers by his father. After his Dad passed away quite suddenly, Chris was plunged even deeper into their shared passion, pushing him to break the limits of what he thought possible. It's been something of a life's work for Chris, who continues to push the limit, defy the odds and challenge himself to believe in the power of dreams. To local surfers, Chris was something of a legend.. to international surfers on America's West Coast he was known as the crazy South African guy with a short board, a big smile and the guts to stare death down. The documentary covers Chris, his family and follows the trail of events, surf tours and big breaks that led to him being invited to the prestigious Mavericks big wave invitational. Through a series of interviews with friends, family, surf pioneers and professional surfers, we get a clearer picture of what drives Bertish and the extraordinary lengths to which he went in order to make the cut. It's a classic tale of perseverance, determination, courage and deep-rooted passion. From home videos and surf photography to holiday videos and epic surf footage, Ocean Driven gives us the gritty true story from the inside out. Bertish propels the story with first hand experience, recounting the emotion and situation, backed by interviews with some of the sports biggest names: Kelly Slater, Greg Long, Mark Healy, Clark Abbey, Gary Linden and Carlos Burle. The rapid fire editing keeps the lesser quality video material fresh and fast-paced as we get to the core of Bertish's amazing true story. The on-the-road footage of surf spots around the world has an Endless Summer feel, while we get an inside perspective on the challenges and innovations of daring to do the near-impossible. The surf documentary ratchets up to the big day at Mavericks that changed the game. Ocean Driven could've been even more compelling if the film-makers had split Bertish's against-the-odds journey to the hallowed Mavericks competition over the course of the documentary to build tension. They could have gone deeper to excavate spiritual significance. 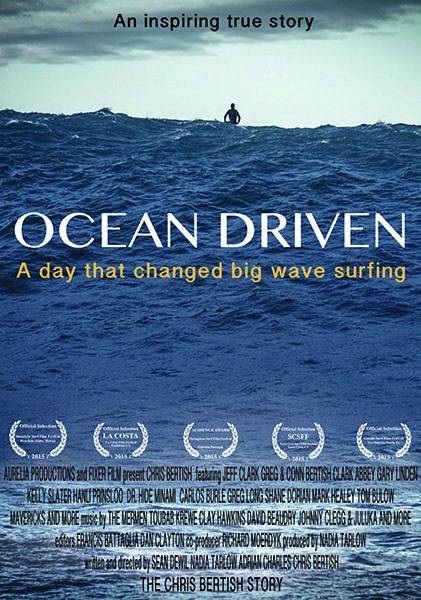 Ocean Driven may not have the polish and scope of Riding Giants, but works as a start-to-finish inspirational sports documentary and the achievement, footage and testimony are powerful on their own.